[sc:date] Companies that produce, transport, store or otherwise handle acids in the workplace should create a plan for safely cleaning up chemical spills. Whether they’re small or large, all chemical spills involving acids require a different approach to cleaning. 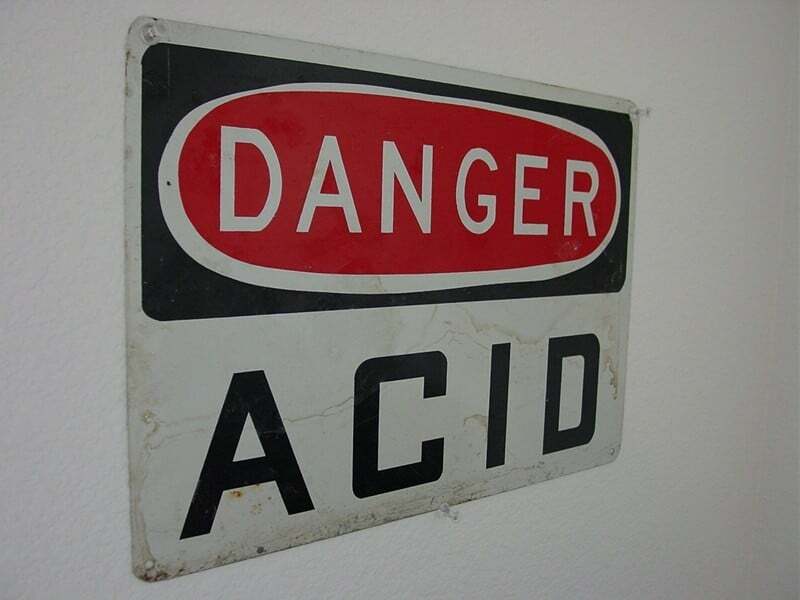 Acids can burn the skin, eyes, irritate the respiratory system, create a fire hazard, and even pollute the atmosphere. This is why it’s important for companies to use extra caution when dealing with acid chemical spills. For some helpful tips on how to safely clean up an acid chemical spill, keep reading. One important tip for cleaning up acid chemical spills is to wear the right personal protective equipment (PPE). Just as the name suggests, PPE is gear that’s designed to protect the wearer from chemical-related bodily harm. Since acids are highly corrosive, users need must wear PPE that’s able to withstand it’s corrosive power. See the list below for a brief overview of the appropriate PPE for chemical spills involving corrosive acids. Eyewear – chemical safety goggles with a face shield. Respiratory – air purifying respirator with acid cartridge. Skin – professional-grade rubber (or similar synthetic material designed specifically for acids) boots, gloves, and suit. There are a couple of items recommended for cleaning up acid chemical spills, one of which is absorbent pads. These pads are designed to soak up the spill so it doesn’t spread to other parts of the workplace. Absorbent pads are highly effective at cleaning up a wide variety of chemicals, including acids. You simply place them directly in the spill and they’ll gradually ‘absorb’ its contents. The exact size and amount of absorbent pads depends to the size of your spill. Small spills may only require a few similarly small pads, while larger spills may require half a dozen or more. Be sure to check out the current selection of absorbent pads and rolls here. 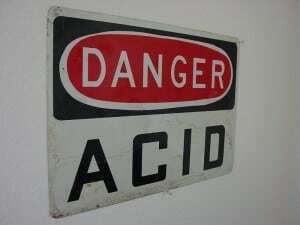 Of course, an acid neutralizing agent is also recommended when cleaning up acid chemical spills. 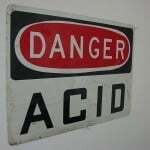 Having a bucket of acid neutralizer readily available in your workplace could mean the difference between cleaning up a chemical spill yourself, or having to call the local fire department to send a hazmat team down (in which you may be responsible for the bill). Using an acid neutralizer is as easy as sprinkling the powder-like substance over the acid spill. Please note, however, these are not intended for use in spills involving hydrofluoric acid.